Tom Stuchfield tells fascinating stories. They are jam-packed with detail: heroic, messy, bloody, romantic, humorous. 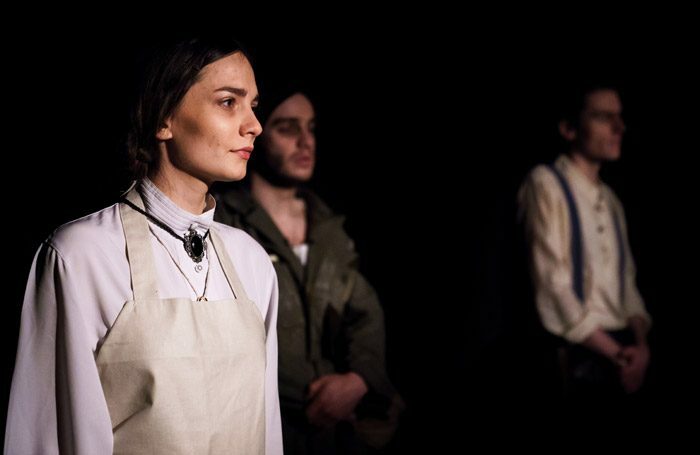 Unfortunately, this rich material about a group of soldiers and civilians caught up in the brutality of the First World War on the Italian Front, remains closer to a novella than a play. Isabella, an Italian tailor, is married to the enemy, Volker, an Austrian soldier who – ironically – keeps his promise not to kill her countrymen. Their lives are intertwined with that of the engaging English soldier Spencer and his acid-tongued French mistress, Mathilde, a grieving munitions worker in Hendon. An American red neck and a suicidal British officer complete the line up. These six stand in a line in front of a black backdrop. A spotlight picks out whoever is the focus of a particular thread; those in the dark become narrators. They interact verbally but never change position and scarcely touch. These stories are part of Stuchfield’s family history. But the play itself requires some surgery. The cast do well with its wordy constraints, especially Olivia Hanrahan-Barnes who doubles successfully as the murderous but love-struck Isabella and a gobby Austrian gunner, and Julia Kass as Mathilde, whose vicious banter with her sister-in-law conceals a deep sense of loss. In the poignant ending, Isabella and Mathilde, alongside Spencer and Volker, played respectively by Stuchfield and Chris Born, demonstrate touchingly that surviving war requires further courage. But the emotional impact could have been so much greater.